So, I don't know about you but every once in awhile, usually around holidays and special occasions, I like to add little themed treats to my kids lunches. However, our school has requested that all items be healthy. Ummm, Hello!!! That's not always easy. 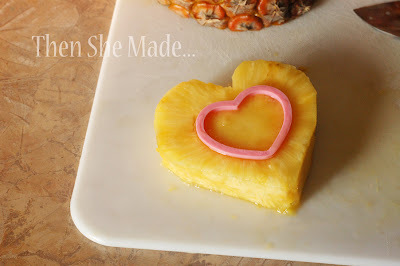 I'm a sweet-treat kind of gal and to be honest, I really don't mind if my kids eat a piece of chocolate or a heart shaped rice crispy treat every now and again. Anyway, in an effort to better support their request, this is one of the treats I'll be putting these in my kids lunches over the next few weeks. Here's how you make it... it's easy! FYI: The cookie cutter isn't really needed so don't fret if you don't have one. You can totally do this free-hand. 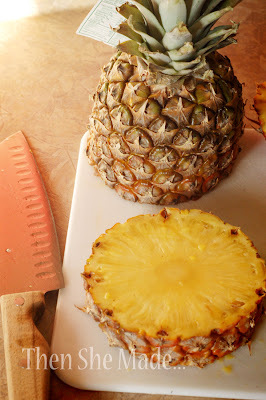 Step 1: Cut a slice of pineapple. Then carefully trim off the rind . Step 2: Cut the outer edge of the pineapple into the shape of a heart. I free handed this as I didn't have a cookie cutter the right size. After the shape is how you want it, take a small cookie cutter (or free-hand cut it as well) and core out the center of your pineapple slice. When you are done getting the core out, you should have something that looks like the photo above. 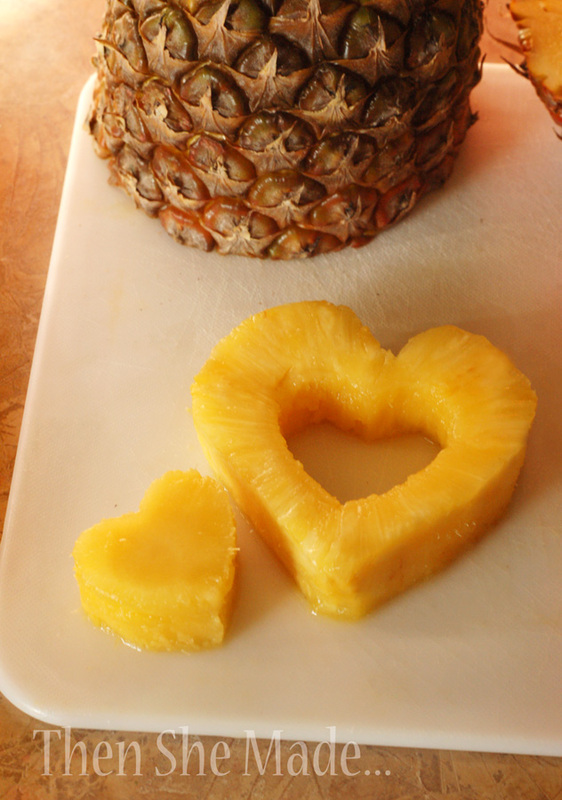 Then set the pineapple heart aside for a bit. Step 3: Next, take a kiwi and peel it, than slice it. 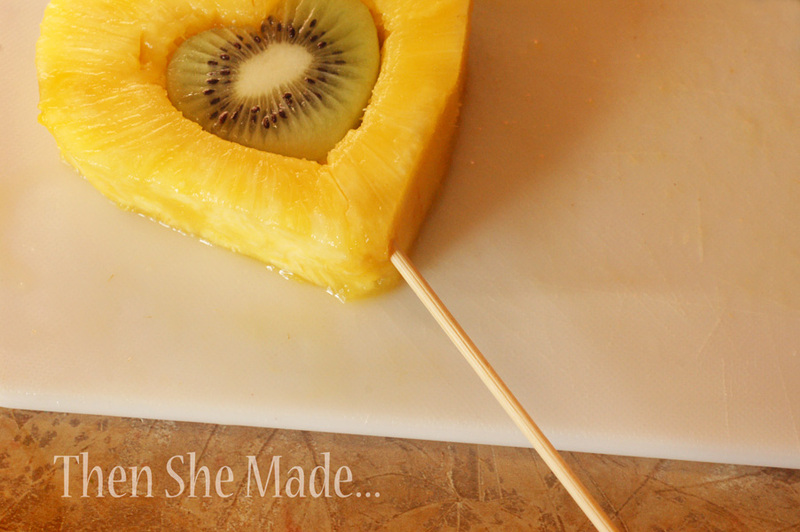 Because kiwi is pretty soft, make sure your slice is fairly thick. 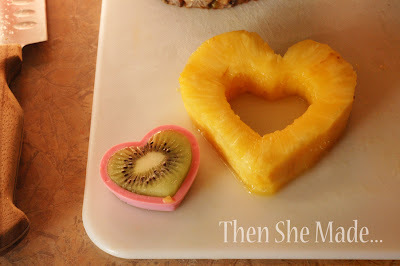 Then, using your cookie cutter, cut your kiwi into a heart shape. Step 4: Place your kiwi heart into the center of your pineapple. Then, take your food skewer and run it through the middle of both the pineapple and the kiwi. 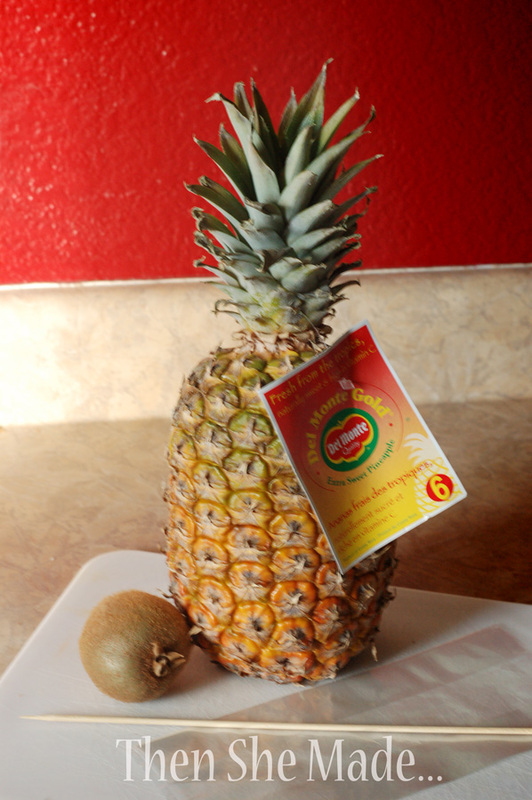 Step 5: After the fruit is secured on the skewer, put it in a bag and tie it closed. 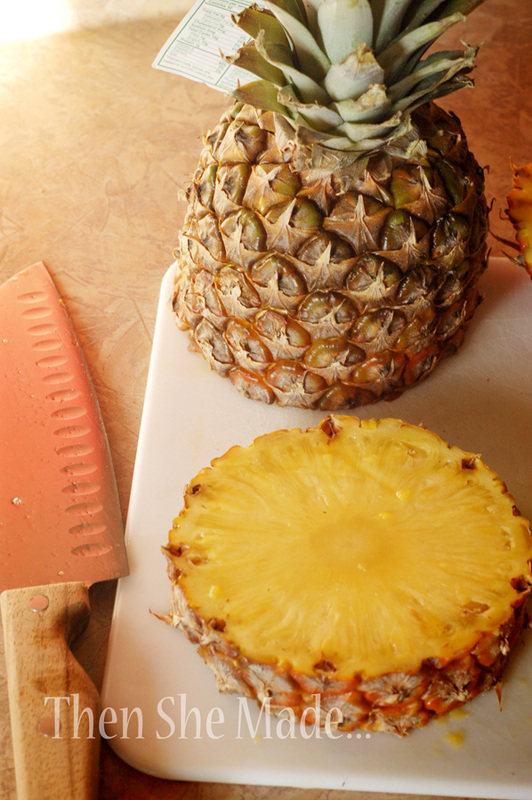 This will help to keep the juices under control and make it look more like a special treat. To finish it off, tie on a cute bow and add a special message. Fun idea. 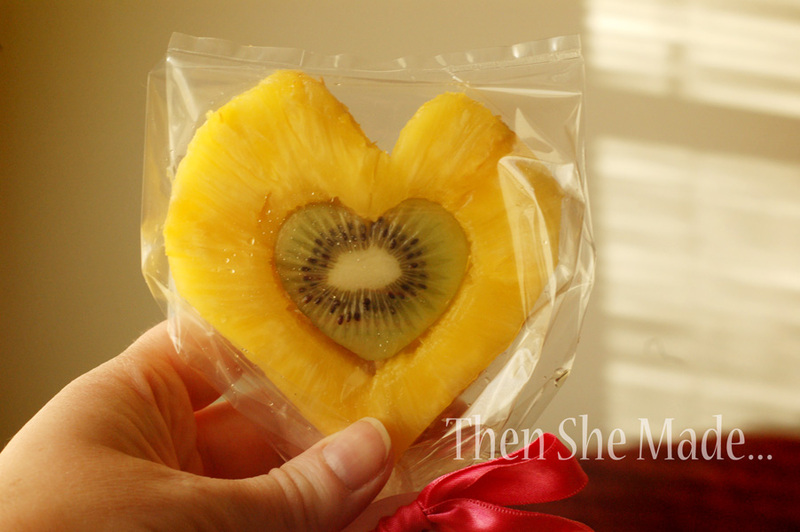 I don't know if I could do that -sending only healthy treats on Valentine's Day. I'm a sweets gal and if it's for a special occasion I say "Let them eat cake!" (literally and figuratively...). haha. Good on you for coming up with an alternative. cute! I could eat that right now! 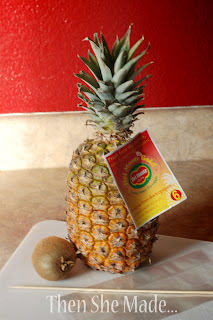 Very creative and fruitalicious! Thanks for sharing! I love this idea. My son's school is also promoting the healthy eating habits. I love this cute and healthy idea! 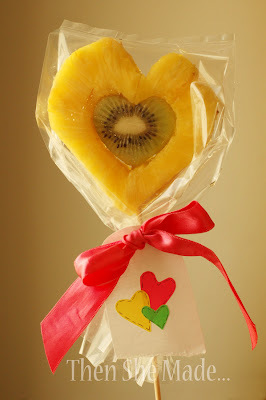 It's a perfect treat to place in a child's lunch box on Valentine's day!